DD Form 2329 - also known as the "Record Of Trial By Summary Court-martial" - is a United States Military form issued by the Department of Defense. 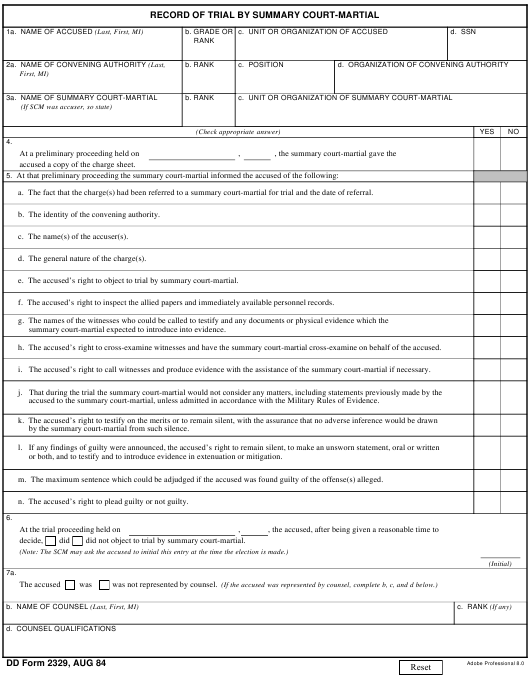 The form - often incorrectly referred to as the DA form 2329 - was last revised on August 1, 1984. Download an up-to-date fillable PDF version of the DD 2329 below or request a copy through the chain of command. accused a copy of the charge sheet. a. The fact that the charge(s) had been referred to a summary court-martial for trial and the date of referral. b. The identity of the convening authority. d. The general nature of the charge(s). accused’s right to object to trial by summary court-martial. f. The accused’s right to inspect the allied papers and immediately available personnel records. summary court-martial expected to introduce into evidence. h. The accused’s right to cross-examine witnesses and have the summary court-martial cross-examine on behalf of the accused. i. The accused’s right to call witnesses and produce evidence with the assistance of the summary court-martial if necessary. accused to the summary court-martial, unless admitted in accordance with the Military Rules of Evidence. by the summary court-martial from such silence. or both, and to testify and to introduce evidence in extenuation or mitigation. m. The maximum sentence which could be adjudged if the accused was found guilty of the offense(s) alleged. right to plead guilty or not guilty. did not object to trial by summary court-martial. was not represented by counsel.